This apartment is located in the Hochparterre district of a freestanding, two-storey, multi-party house and is located on the south-eastern outskirts of Bruges, just between the two small towns Gronau and Alfeld in the heart of the Leineberglandes. The apartment is about 82 m² in size and has been renovated in 2017. It has a fully equipped kitchen with an oven, a ceramic hob, a refrigerator with freezer, a dishwasher, a microwave, a toaster, a water cooker, a coffee machine and an integrated espresso machine for four persons. The spacious living area is tastefully decorated and offers a sofas seating area and a wood-burning stove. In the living room you can use the flat-screen TV via the in-house satellite system or watch DVDs with you. Also for the pastime (eg in bad weather) some social games are available. The first bedroom with a double bed (1.45 m width) provides for a restful sleep through a reversible mattress with different degrees of hardness. The second bedroom has 2 single beds each with a width of one meter. For the accommodation of another guest a folding mattress is available. The tiled bathroom is equipped with sink, shower and WC. A washing machine, a dryer for common use, as well as vacuum cleaners and other cleaning utensils are located in the building. In addition, in all rooms can be heated and a mobile fan is available. WLAN can be used in the whole building. The kitchen is equipped with a furnished balcony. From the quiet balcony you have a wonderful view of the mountains and the spacious garden (shared use) with a covered barbecue. There is also the Finnish wood-fired sauna with a fantastic panorama view. Through the edge of the field there is an unobstructed view to the east towards the 395 m high Table Mountain and the seven mountains of Alfeld. You can park your car on the private parking space in front of the house. A pet is allowed. Especially nature lovers can enjoy this holiday home, peace and relaxation are guaranteed. But also sports-active people come here fully to your expense. Mountain biking, hiking, canoeing on the leash, the Leine-Heide cycle path, swimming pools and the nearby golf course provide for a varied leisure time. And all this away from crowded tourist resorts. With only about 30 minutes' drive to the exhibition grounds of Hanover, the apartment is also an ideal place for trade fair visitors to find peace and relaxation away from the big city bustle. The most popular excursion destinations are the Leinebergland (0 km), the Fachwerkstadt Alfeld (6 km), the World Cultural Heritage Hildesheim (25 km), the Hamelnfangerstadt Hameln (40 km), Hanover (40 km) and Harz (60 km) and the leisure park Rastiland (20 km). The next baker, butcher, supermarket and weekly market are located in six kilometers in Alfeld or Gronau. Wir haben einen Kurzurlaub mit unseren drei Kleinkindern in der Region gemacht und diese schöne und gepflegte Ferienwohnung gefunden. Empfehlenswert, sehr gut ausgestattet und sehr nette Vermieter. Empfehlenswert, wir kommen gerne wieder! 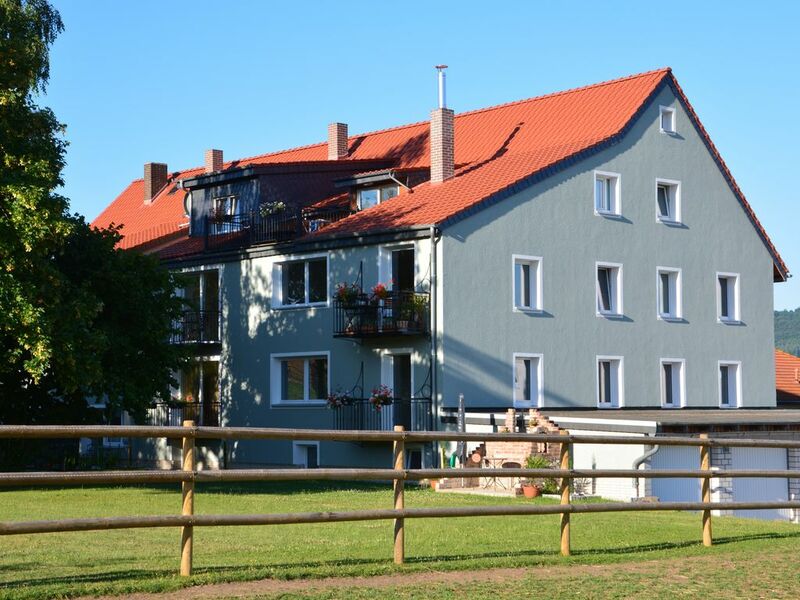 Saubere, frisch renovierte, geschmackvoll eingerichtete Ferienwohnung mit Blick auf eine Ferienkoppel und Maisfelder. Sie ist etwas abgelegen, jedoch kann man die umliegenden Städte wie Hildesheim, Alfeld und Hameln (45min) mit Auto gut erreichen. Wir sind für den Besuch in den Kinderpark Rastiland gekommen, Entfernung dafür optimal. Die Vermieter sind sehr nett und bei Fragen schnell erreichbar. Die Ferienwohnung können wir nur weiterempfehlen! Großzügige Zimmer mit guter Ausstattung. Grillplatz und Rasenfläche kann man mitbenutzen - gut geeignet für einen Urlaub mit Kindern. Aktivitäten sind mit dem Auto schnell zu erreichen. Guter Startpunkt für Ausflüge.